This pitch for MPB Today positions it as the Walmart Freedom Club. The pitch misspells the word "prosper" as "prospour." The website registration is hidden behind a proxy, and uses Walmart's name in the domain name. It is unclear if Walmart authorized the domain name or the use of its intellectual property in the MPB Today promo. 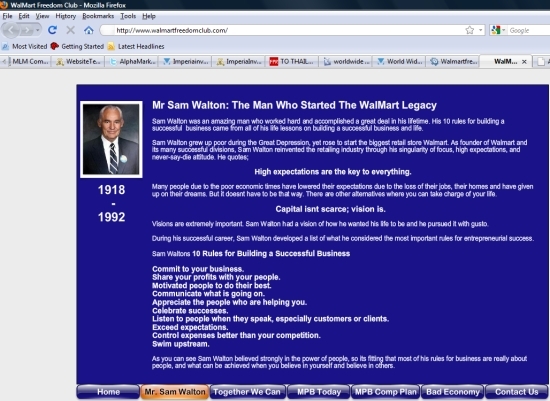 Sam Walton is the late founder of Walmart. It is unclear if the owners of the website have Walmart’s permission to use its name and the likeness of Sam Walton in a pitch for the MPB Today program. Also unclear is whether the website owners have the permission of Trump and Buffet to use their images in promos for MPB Today. 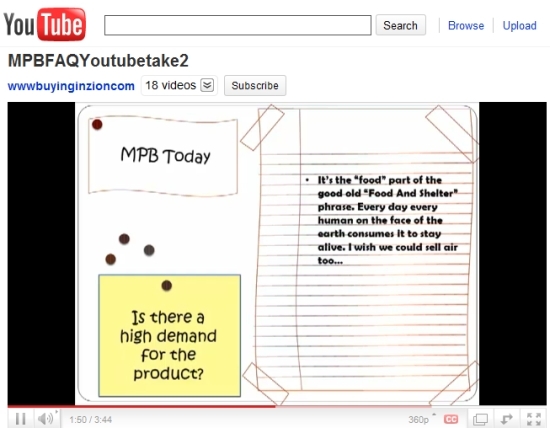 Separately, yet another pitch for MPB Today features a narrator who notes that food is necessary to stay “alive” and laments, “I wish we could sell air too.” The “air” video is on a restricted YouTube site maked as “unlisted.” An unlisted video “means that only people who know the link to the video can view it (such as friends or family to whom you send the link,” according to YouTube. 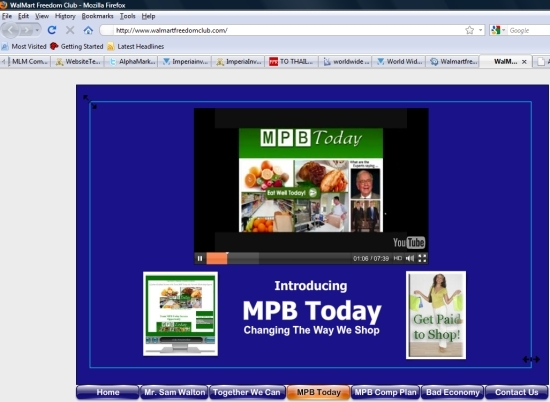 MPB Today is a multilevel-marketing (MLM) program based in Pensacola, Fla. The “opportunity” is tied to a grocery business in Pensacola known as Southeastern Delivery. Both companies are linked to Gary Calhoun, who has a poor track record with the Better Business Bureau and was the recipient of a warning letter from the Food and Drug Administration for his marketing of a product that purported to be a treatment for Lou Gehrig’s disease, Herpes and Alzheimer’s, among others. The new domain that uses Walmart’s name is at least the third linked to the MPB Today program — and the second to position MPB Today as a “club” tied to Walmart.Â The domain was registered Sept. 9, after MPB Today itself removed images of Walmart, Buffet and Trump from the homepage of its website. Other MPB Today-linked websites branded with Walmart’s name imply the retail giant offers free groceries or that Walmart is partnered with MPB Today. Meanwhile, still-other websites linked to the MPB Today program position it as a “Grocery Assistance” program and a program linked to the Food Stamp program administered by the U.S. Department of Agriculture. MPB Today also is being pitched from known Ponzi and criminals’ forums such as ASA Monitor, TalkGold and MoneyMakerGroup. On Wednesday, the SEC filed an emergency action in federal court in Utah to stop a program known as Imperia Invest IBC dead in its tracks, amid allegations it had fleeced millions of dollars from thousands of Americans with hearing impairments. Like MPB Today, Imperia was promoted on the Ponzi forums. Among the allegations in the Imperia case were that the operators were using trademarks and the intellectual property of a major company — Visa Inc. — without the company’s authorization. All in all, more than 14,000 Imperia investors were fleeced, the SEC said. In this separate promo for MPB Today, a narrator notes that food is necessary to stay "alive" and laments that he wishes members also could sell "air" through the MPB Today MLM program. Some readers will remember the MPB Today promo that attacked President Obama and Secretary of State Hillary Clinton. Secretary Clinton once was on Walmart’s board of directors — the first woman appointed to a Walmart board post. Secretary Clinton, an attorney, once worked for a law firm that performed work for Walmart. These things point out the bizarre incongruities of MPB Today. It is just plain bizarre that at least one affiliate believed it prudent to attack the President and Secretary Clinton in order to drive business to MPB Today, which dispenses Walmart gift cards to winners in the MPB Today 2×2 matrix. 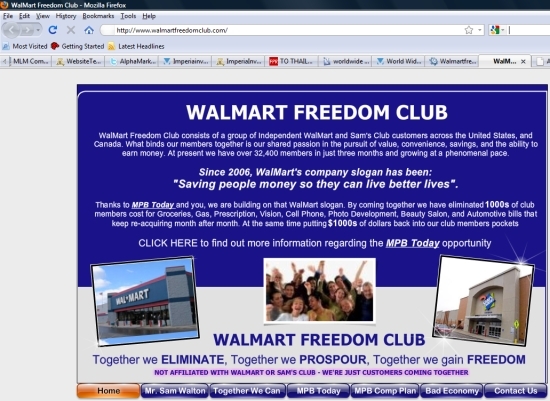 The person behind the “Walmart Freedom Club” site is also associated with or promoting “Numis MLM Network”. So that’s yet another person who knows or should know exactly that MPB Today is an obvious pyramid scheme. I also saw what I think were two other videos by the same person, one may have been similar to one we’ve seen before. I didn’t play it but the screen dump appeared to show the pyramid structure of this scheme. If Walmart’s Legal or Compliance Department have been alerted to these abuses, it is hard to imagine that they have not taken action, although they have chosen not publicize the fact. And here we are again with more of the same old same old. The same cast promoting the same tired old scams with yet another set of new clothes. What is especially noticeable is that they are leaving it to their faithful believers to do the protesting with greater frequency than before. The steroidal puppeteers have learnt to fly under the radar and the next tier down also seem to be learning (with a few obvious exceptions). The new Task Force has its work cut out and needs all the help they can get. Thank heaven for blogs like this one. All of these MLM or network marketing comapanies have rogue distributors that do this kind of stuff. A good company will shut this down and in most cases will remove the distributor. So why is MPB an illegal Ponzi scheme? Compared to what? What about all of the other MLM or newtwork marketing companines out there. Some of these companies have been around for years. Itâ€™s no different than an insurance company that issues health insurance. They charge ridiculous premiums banking on the fact that the majority will never file a claim! But what if one year every policy holder had a claim? The insurance company would be broke and would be unable to pay! Itâ€™s no different with MLM or Network marketing companies. Only about 5% of people that join these companies every make any money and these companies understand that. So, 95% fail which actually is about the same failure rate of a traditional business. Iâ€™ve been in a few of these companies and did not make a dime but only blame myself. I was excited in the beginning but just did not want to work the business. So you wonder how they can make these payouts when it appears theyâ€™ve got more money going out then they do coming in. Its simple, the majority will pay to get in the business and then never receive a dime in return because the will not work the business. Bruce Smith: All of these MLM or network marketing comapanies have rogue distributors that do this kind of stuff. If you’re in MPB Today and have qualified for or received payments from the 2×2 matrix cycler, are you confident the money you received is “clean?” How could it be clean if “rogue distributors” are lying to get people to sign up? And what should MPB Today do with the money it is receiving from rogue affiliates, including the rogues on the Ponzi boards? Bruce Smith: A good company will shut this down and in most cases will remove the distributor. Yes, I agree. MPB Today should “shut this down.” I think it should announce to the membership that the rogue affiliates have created an untenable situation that has obligated the company to call the the authorities and its credit-card processing company. Along those lines, I think MPB Today also should call its bank to let the bank know that both it and the members realize that money is coming in from rogue affiliates who are advertising the 2×2 matrix cycler on known Ponzi scheme boards, while at once targeting Food Stamp recipients, foreclosure subjects, people of faith, college students, senior citizens, and opponents of President Obama, the First Lady, and Secretary of State Clinton. And MPB Today also should let the authorities, credit-card processor, bank and Walmart know that it is aware of the U.S. Secret Service probe into the alleged Regenesis 2×2 Ponzi scheme. Bruce Smith: So why is MPB an illegal Ponzi scheme? Compared to what? What about all of the other MLM or newtwork marketing companines out there. Some of these companies have been around for years. Itâ€™s no different than an insurance company that issues health insurance. They charge ridiculous premiums banking on the fact that the majority will never file a claim! But what if one year every policy holder had a claim? The insurance company would be broke and would be unable to pay! Itâ€™s no different with MLM or Network marketing companies. This is roughly the same MLM deflection a poster by the name of “CORRECTION” used here when defending the AdViewGlobal (AVG) autosurf — before it suspended member cashouts in June 2009. AVG had members/management and promoters in common with the alleged AdSurfDaily Ponzi scheme, the victims of which are being targeted in MPB Today promotions. Both ASD and AVG were promoted on the Ponzi boards, as was the judicially declared CEP Ponzi scheme. Did you know that MPB Today also appears to have ties to CEP Ponzi scheme promoters, Bruce? Bruce Smith: Iâ€™ve been in a few of these companies and did not make a dime but only blame myself. Bruce Smith: I was excited in the beginning but just did not want to work the business. Bruce Smith: Its simple, the majority will pay to get in the business and then never receive a dime in return because the will not work the business. This rationalization to sanitize a pyramid scheme was trotted out by an MPB Today member last Sunday (eight days ago). On the very same day, “Ken Russo” announced a “rebate” plan for MPB Today on the ASA Ponzi and criminals’ forum. P.S. Whenever a comment such as this one I made in response to your comment is made here or elsewhere, the Ponzi/pyramid enthusiasts normally resort to the “evil bankers” deflection — i.e., that fat-and-happy banks turn a blind eye to money-laundering because it’s good for profits and that the government later bails out the fat-and-happy banks when they’re no longer fat and happy. From time to time the Ponzi/pyramid promoters also work in a good conspiracy theory about the Federal Reserve — and sometimes even reptilian aliens and fanciful theories about how all commerce is legal as long as both parties agree to a contract. This theory later morphs into a fanciful theory that the government can be charged with treason or interference with commerce for acting against Ponzi and pyramid schemes. Sometimes the fanciful theorists try to sue the government for more than the projected tax receipts for the entire nation for the entire year. The fanciful theorists do this by claiming to be “sovereign” or by advancing the notion that they are the branch of a sovereign nation that just happens to have a satellite office in Las Vegas while simultaneously having a satellite offshore. These “paper” nations somehow make all of this real. There is a very simple way to determine if MPBToday is a legitimate MLM company or an illegal pyramid. To be a legal MLM company 70% of your income must come from retail sales, not members in your down-line. This means you must have customers. This has no outside customers, and all of your income comes from recruiting. Therefore it is an illegal pyramid scheme. This is not about free groceries for life, but about the money. The fact you do not see this, or did not know this, says far more about how thoroughly you check things out before rushing in to join. Anyone who bothered to do a little checking would have found this information out. It is not hidden. In fact all you had to do was go to the FTC website and you would have known immediately this was not a legal MLM company. Besides, a 2×2 matrix is the worse possible format for a MLM company to use. While you might be able to get your two, it is not as easy for your two to get their two, and this repeats itself down the line. When they can’t, your people drop out because they are not cycling, and then you have to start all over again so you can cycle. It is the kiss of death. This will imploded on itself, even if the governmnet doesn’t shut them down first. In fact, they are already in trouble getting enough new people to keep this going. Just shows you how desperate people are right now for they will fall for anything. Besides, there are far more “rogue” promoters than regular members. This type of program always does. But this a legitimate MLM, get serious. Bruce Smith: Only about 5% of people that join these companies every make any money and these companies understand that. So, 95% fail which actually is about the same failure rate of a traditional business. This another statistic trotted out by MLM promoters, but it is not, happily true. 95% of all businesses which are legal and properly capitalized do not fail, neither do 95% of all salesmen make a loss when selling a legitimate product or service. The figures may not be as good as people would like, but a 95% failure rate by all salesmen in legitimate businesses and a 955 failure of all legitimate businesses is nowhere near realistic. Look around your town as tell us that 95% of businesses have failed – even in this economic crisis. See if you can tell us of more than 10 MLM companies that have lasted more than 10 years, or even 5! See if you can demonstrate that 95% of people who work in sales are losing money – even in this economic crisis. See if you can find more than 5% of MLM reps who are not losing money – at any time, including the boom years. The MLM failure rate is BECAUSE of the model and not because of laziness or imcompetence of their salesmen and women. The MLM companies with only 5% of their employees and IBOs making any money at all frequently still make profits and may be very successful businesses for their owners. In a thriving bricks and mortar company, you will find more than 95% of their employees and salesmen making money. Comparing apples and oranges does not prove the effectiveness of MLMs for the people involved in them, nor does it legitimize MPB Today, where you can only make money if 6 below you pay, and the same for them. Then ask yourself, how long will it be before one of your six or one of their six doesnt find sufficient recruits and loses their money? Lynn: This is not about free groceries for life, but about the money. The fact you do not see this, or did not know this, says far more about how thoroughly you check things out before rushing in to join. Anyone who bothered to do a little checking would have found this information out. It is not hidden. In fact all you had to do was go to the FTC website and you would have known immediately this was not a legal MLM company. Lynn, get your head out of your rear end. All of these MLM network marketing companines are about making money! It’s the money that attracts people to the business not the products. That’s what it’s about and always has been. Even in what you call the legitimate companies people will pay ridiculous prices for a monthly product that they could probably get cheaper elsewhere. Why do you think they do this? Also, you should not make assumptions. You know what they say about people who make assumptions! I am not involved in MPB! Patrick, Lynn, and Wishful Thinking! If at all possible I would like to know if you are involved in any MLM or network marketing comapany! If so could you please provide the name of that company. Bruce, for someone who knows so much, you sure know how to underestimate the knowledge of the authors of the posts on this blog. You came here giving the impression that you supported MPB Today and people took the time to explain to you and anyone else who was reading it WHY it couldnt work and was both immoral and almost certainly illegal. You pose a question to Patrick, Lyndell and myself that would be insulting if it wasnt so obvious that you havent bothered to read Patrick’s previous articles and were trying to score points. What you seem to forget is that many of the people here do not go to the FTC website, but they do read Patrick’s blog. They do not need to be told they are fools for not knowing about the FTC websites , but they do need to understand why they are involved in something that is not what it seems. I asked a simple question about whether or not you were involved in MLM or network marketing. I don’t really care if it insluts you or not. You seem to all know a lot about the pitfalls of the industry, so who knows, maybe I would conclude that your opportuntity was right for me. Then again, I might just rip into it and find all of the negatives and why I feel it would not work for the average person. I don’t expect an answer but my question still stands. Are you involved in mlm or network marketing? And if so, what company are you with! I am also baffled by your comment that I am trying to “score points”! With who? WishfulThinking: Bruce, for someone who knows so much, you sure know how to underestimate the knowledge of the authors of the posts on this blog. You came here giving the impression that you supported MPB Today and people took the time to explain to you and anyone else who was reading it WHY it couldnt work and was both immoral and almost certainly illegal. In answer to your MLM question – one in the 80s, and one in the 90s and for the last time, one in the year 2006. Found that nothing had changed, but that the hype had gotten worse. and the products less viable. I cant speak for the rest, but I dont have an agenda. Was scammed once, learnt a great deal and felt duty bound to pass on the knowledge, to help others avoid losing <their money to fraudsters. WishfulThinking: In answer to your MLM question â€“ one in the 80s, and one in the 90s and for the last time, one in the year 2006. Found that nothing had changed, but that the hype had gotten worse. and the products less viable.I cant speak for the rest, but I dont have an agenda. Was scammed once, learnt a great deal and felt duty bound to pass on the knowledge, to help others avoid losing <their money to fraudsters. Thanks for your honest response and I do believe you are sincere. I guess I just question peoples motives because I am having a hard time coming to grips that people on this blog are really looking out for someones $200. Just seems to me that there are bigger fish to fry! Bruce Smith: Thanks for your honest response and I do believe you are sincere. I guess I just question peoples motives because I am having a hard time coming to grips that people on this blog are really looking out for someones $200. Just seems to me that there are bigger fish to fry! With the wonders of modern technology it’s now entirely possible to spend 3 or 4 minutes per day on this blog AND seek out,catch and fry bigger fish, just as it is possible for those so inclined to defend fraud and fraudsters while simultaneously deriding those who seek to expose fraud and fraudsters, no matter the size of said fraud/fraudsters. Try as hard as I might, I cannot find any element of compulsion attached to information provided on this forum. As far as I am aware, readers are at liberty to either accept or deny the validity of opinions posted. think this blog is even responsible for saving even 100 peoples $200. Though I applaude your effort I just don’t think your having an impact!